Importing a car into Ireland from the UK is a relatively straightforward process. There are no import restrictions on UK registered vehicles that can be brought in from the UK and there are no border examinations to ascertain whether a car passes compliance. You will have to pay Vehicle Registration Tax(VRT) On any vehicle you import. Here is an FAQ from revenue which will explain the process. To book a car in for its VRT test click below. VRT tests now take place at most NCT(National Car Test) centres. Before you get to that final part of the import process you should have done extensive homework on what sort of registration tax and annual road tax you will be paying on the vehicle you plan on importing. Registration tax is calculated by a combination of the open market selling price of the car and its CO2 emmissions. There are several bands of payable VRT which are broken down by CO2 emmissions. You can check a cars estimated VRT price by looking at the ROS Calculator. Currently there are savings to be had on cars with low CO2 emmissions. Make sure to check several different models of the vehicle you are looking to import as you may be suprised that different spec levels will have different CO2 outputs. 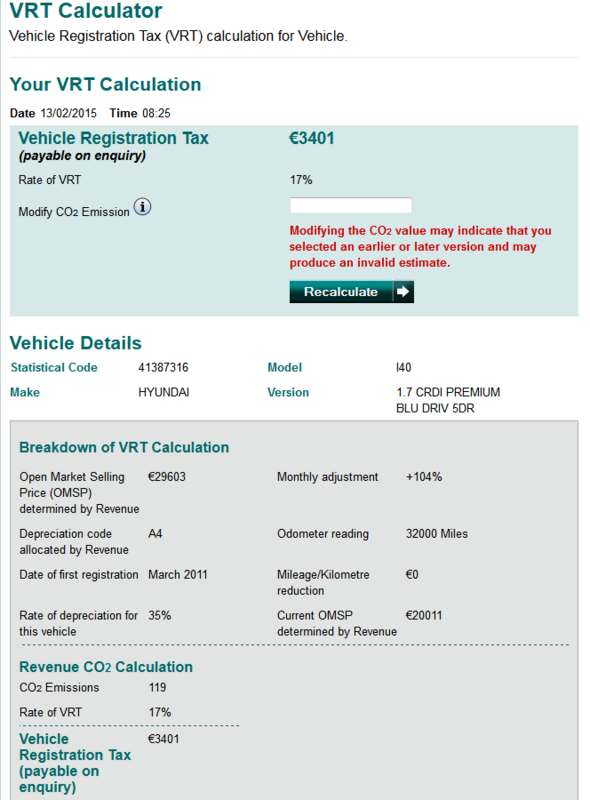 Using the VRT calculator you can get an accurate price of registration tax for the vehicle you are looking to import. Make sure you select the correct details and don’t click on “first registered in Japan” as this applies strictly to Japanese imported vehicles. Entering the correct detail will produce a quotation and statisical code which is used as a reference at the time of registration. Always recheck the VRT quotation as close to the purchase date as possible as it modified every month and may go up or down. Always check and double check the actual CO2 of the car you are importing by doing a VIN check or check by VRM(registration plate). Don’t presume it is a uniform figure per vehicle. For example a very popular car that gets imported regularly into Ireland is a Citroen Grand Picasso 1.6HDi. The CO2 g/km output of this vehicle can vary from 149 g/km to 157 g/km despite having the same engine in all models. Any cars that we inspect have their CO2 emmissions checked with the manufacturer and DVLA for confirmation prior to shipping. Cars in Ireland must undergo a National Car Test (NCT) once they are four years old. 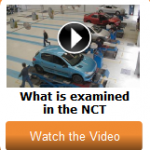 An NCT test is designed to check a cars safety features and general roadworthiness. All our inspections include a preliminary NCT pre-test and if we find any faults that we feel will be flagged or highlighted during an NCT inspection we will inform you. 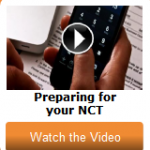 To find out more about the NCT test click below. You can view these official videos to see what the test procedure will involve. Motor Tax Rates based on CO2 Emmissions for cars registered from 2008 only. Motor Tax Rates For Vans and Light Commercials. Motor Tax Rates For Non Standard Vehicles. *All road taxation figures provided by Environ.ie and are intended as a guide only. Please check directly for latest information.